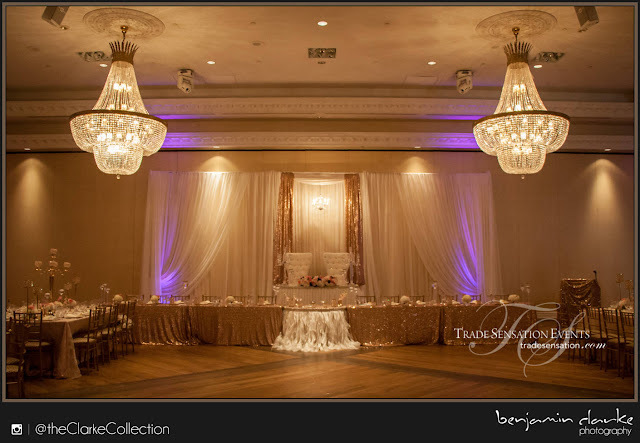 Angelique & Sean's beautiful vintage wedding was celebrated at The Royalton. With the Trade Sensation Team's triple power of wedding planning, decor & floral, the night went off without a hitch! The ceremony was filled with love and sweetness as the couple chose to have sorbet cups handed out after saying their I-Do's, what a nice touch! The reception decor consisted of gold, ivory and rose. The Bride & Groom chose soft blushes, pink and ivory floral arrangements to go with the vintage theme. As a popular trend, they also chose tall gold stands with floral and alternated this with gold candelabras for their centerpieces. Guests were not only swooned with the lavish decor, but also the steel pan musician that brought a nice and relaxing touch to cocktail hour. Thank you for allowing us to be a part of your special day. A big congratulations to Angelique & Sean, we wish you both an amazing lifetime together. You two are perfection together!